Russia’s Justice Ministry signed up its first “foreign agent” under the law that went into effect last November requiring all non-profit organizations operating in the country that receive foreign funding and engage in foggily defined political activity to do so, RIA Novosti reported. The organization, Supporting Competition in CIS Countries, whose purpose is to facilitate observation of laws governing competitive business practices among countries of the Commonwealth of Independent States – the loose confederation of former Soviet republic – remains relatively unknown. The organization was established in 2009, according to its website, and its staff is comprised mostely of lawyers. The organization has, by most Russian media assessments, done nothing to raise hackles or make headlines for allegedly influencing Russian politics, and remains largely unknown – certainly falling short of the bigger fish the Kremlin wishes to fry with the NGO legislation. When contacted by telephone Monday, a spokeswoman for the organization refused to comment on why it chose to register itself as a foreign agent. The vote monitoring agency Golos, meanwhile, told the Interfax news agency that it has paid $13,000 worth of fines for failing to register as a foreign agent – and has further indicated it still has no plans to do so. “We fulfilled the court ruling categorically and paid both fines imposed,” Golos Deputy Director Grigory Melkonyants told Interfax last week. On April 25, a Moscow’s Court fined Golos 300,000 rubles ($9,000) and its head Lilia Shibanova 100,000 rubles ($3,000) for not complying with the new amendments to Russia’s law on NGOs, which were hastily passed by the Duma last summer after Vladimir Putin’s inauguration to his third term as president. Golos appealed the fines, but the appellate court turned them down. The organization has also been suspended from working for six months. What does complying with the law mean? The law that passed last July stipulated that Russian NGOs receiving foreign funding and are involved in vaguely defined political activity are obliged by law to register as foreign agents – as well as display their credentials as foreign agents on their websites and organization literature. As of Monday, Supporting Competition in CIS Countries’ website has yet to self apply the foreign agent moniker on its website. 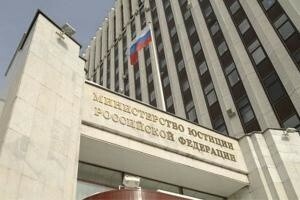 Yet it still remains the single NGO that receives foreign funding operating in Russia to register as a foreign agent. All others have boycotted the registration requirement. Prominent figures in the NGO community have argued that the foreign-agent brand carries connotations of Stalin-era repression. They say that the status requires organizations to deal with extra paperwork and regular checks that many NGOs say would completely cripple their operations. The foreign agent label, said Alexander Nikitin, Chairman of the Environmental Rights Center (ERC) Bellona, also said the foreign agent label would drive away foreign contributors who typically shy away from contributing to political causes by saddling NGOs with an overtly political characterization. The law has been slammed by Amnesty International and many other prominent Russian NGOs, including the Moscow Helsinki Group, Transparency International, Memorial, Bellona, and Golos, which earlier accused the Kremlin of rigging the 2011 Duma elections to favor United Russia, the Kremlin party of power. The revelations of the vote fraud, much to the surprise of the Kremlin, unleashed months of anti-Putin street demonstrations, sometimes tens of thousands of people strong, in most of Russia’s major cities. In that sense, Golos could not but help become the first victim of the NGO law. On Friday, group leader Shibanova reiterated to Interfax that it has done nothing to break the law, and that it would still not register as a foreign agent. The organization, in fact, went so far as to return foreign prize money from the Sakharov Freedom Prize awarded to it in 2012 by the Norwegian Helsinki Committee. Golos Deputy Director Melkonyants told The Christian Science Monitor in a separate interview that he expects the organization would be liquidated and that the group was considering various responses – one of which is a risky plan to officially disband the organization and recreate it under a new name during the six months Golos’ operations are suspended. All information resources of the Golos association have been transferred to people who will cover activities of new organizations, Melkonyants said. He said he hopes that the establishment of two organizations would be completed soon. The first organization will be “In Support of Consumer Rights,” which will work as a private association without state registration. The second one is the Golos non-governmental organization – the form of the name is still being specified – working “with state registration as a legal entity,” Melkonyants told Interfax. “We are suing the prosecutor’s office and the Justice Ministry, and we will take that all the way to the Constitutional Court if necessary. We’re going to launch an appeal to the European Court,” he said. Although the law took effect in November, confusion about how to enforce it reigned even within the Justice Ministry itself. By March, on Putin’s orders, prosecutors throughout Russia’s regions had been assembled and ordered to begin unannounced raids on NGOs in conjunction with health and fire inspectorates as well as the government’s tax agency. The purpose of such an assemblage was to attempt to unearth fire and health code violations that often carry with them fines that can exceed those levied for not registering as a foreign agent. Some 600 NGOs were raided in such a fashion, including ERC Bellona, which was swooped on by prosecutors and health and fire inspectors on March 20. Nikolai Rybakov, ERC Bellona’s executive director was summoned several times to the prosecutors’ office only to be turned away and told that fines for fire code violations had not yet been assed. He was months later told only Nikitin, as the organizations chairman could accept notice of fines. On May 23, Nikitin was told that the prosecutors had instructed fire officials to levy any fines, which could be as high as $20,000. Nikitin said ERC Bellona would immediately appeal any fines. At the same time he is taking a cautious approach. Putin claimed in April that Russian NGOs received a combined $1 billion in foreign funding in 2013 alone, though Golos and several other NGOs called the figures grossly overstated. The Justice Ministry, which Putin said provided the figure, has consistently refused to reveal the sources for its data.